Today riding the TGV has become common place. However in 1981 when the service between Paris and Lyon was inaugurated it was a novel and exciting way to travel and it was with mounting excitement that I arrived at Paris Gare de Lyon in ample time to join a TGV south to France's second city. Photo - A TGV in the original livery at Lyon Perrache station. In those days Gare de Lyon was full of character. The main concourse was full of people heading south on the network of lines originally built by the PLM (Chemins de fer de Paris à Lyon et à la Méditerranée). Destinations included Marseille, Nice, Lyon, Clermont-Ferrand and Dijon to name a few. The station with its grand architecture and glazed train sheds is also famed for the Le Train Bleu restaurant, which has served drinks and meals to travellers since 1901 in a wonderful ornate setting. At that time most SNCF mainline trains were loco-hauled with powerful electric locos that were unmistakably French in design. Rolling stock was 'standard' issue European carriages that were both roomy and comfortable often with a choice of open and compartment stock in the same train. 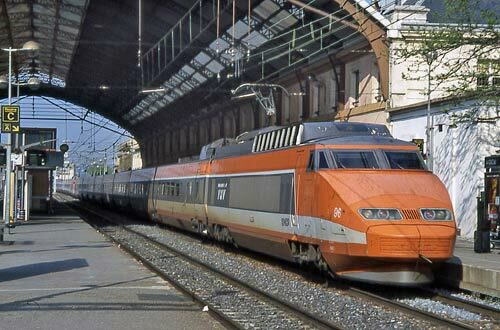 Amongst all this conventional rolling stock, three platforms held gleaming brand new TGV trains in their original orange and grey livery with even casual travellers stopping to look at what the French saw as the start of new beginning for rail travel. If I remember correctly my train was standing at platform 7. It consisted of two ten car sets that total over 1300 feet in length (400 metres), which meant a lengthy walk down the platform was required for my reserved seat in a carriage three from the front. Inside standard class was still in pristine condition and luckily I had a window seat facing forward. Rather surprisingly the train was only half full when we left on time and I was able to spread out and relax. Heading out from Gare de Lyon you pass extensive yards and sidings with suburban trains scuttling along to and from the suburbs. So far nothing exceptional as we accelerated up to conventional speed. Veering left off the main line we headed into a lengthy tunnel and began to accelerate. Soon the Paris suburbs were behind us and we sped across flat land towards Lyon. At this time trains were running at the original speed of 168 mph (300 km/h) and this felt supersonic compared with normal trains back home. The scenery soon improved as the line headed through more undulating country with a greater impression of speed. What was also noticeable was the way the line followed the contours of the land with some steep gradients. Some sections felt more like a roller-coaster than a train! Farms and villages flashed by with an occasional TGV heading to Paris passing in a couple of seconds. Trees were starting to take on their autumn colour on this sunny October day as I enjoyed the relaxing trip. I was not so impressed with the buffet car where a lengthy queue had formed for what appeared to be a limited range of food. Prices were high. A disappointing 'sandwich jambon' and an extremely strong coffee did little to convince me that this was the place to eat despite its high speed. Anyone taking this journey will be surprised at how rural this part of France is. This perhaps explains the relative ease of planning and building this new main line which was completed very quickly by British standards. For the first time since leaving Paris the brakes were being applied. A quick look my watch confirmed I had left Paris less than two hours ago. Regaining conventional tracks we snaked down to cross the River Rhone and came to a stand at Lyon Part Dieu station. A few minutes stand and we were away again for the final slow three miles to Lyon Perrache where the train terminated under the large train shed some 268 miles from Paris. My memories of that journey remain quite clear. It was the start of new age of high speed rail travel in Europe and I was pleased that I had sampled the service a few weeks after its start. Today the journey remains much the same. The trains are now faster, the scenery remains the same and food is still poor - however it is still one of the best ways to travel in France.